Home to edible plants, medicinal herbs, and vegetation attractive bees and butterflies, the studio was started in 2010 when the Art and Design Building was completed. “The building was new so there wasn’t much yet in terms of landscaping,’ says art professor Mark Cooley, director of the Green Studio. Some School of Art students were interested in growing things and started planting sunflowers in containers. Soon the studio was started on a piece of land beside the building that is difficult to mow, almost like a hillside, beside a flight of stairs. 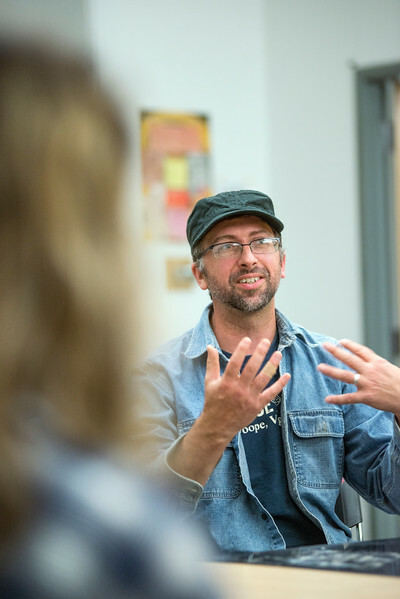 Cooley regularly uses the space to teach a class each semester called AVT 385 EcoArt, which is a university synthesis course that combines arts, sciences, progressive agriculture, and folk traditions. 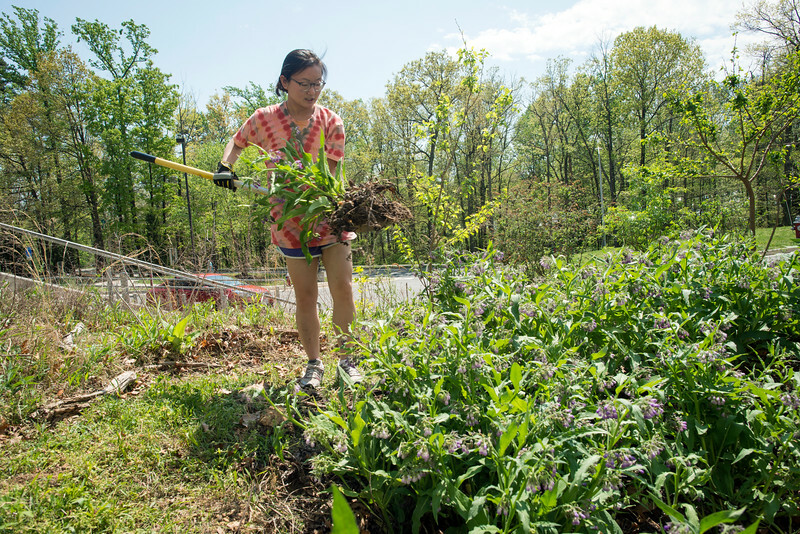 Students who sign up for the class are often looking for a break from what they are majoring in and care about the environment and sustainability. During a recent class period, several students worked in the studio with visiting ecoartist Robert Kupczak. Others built objects such as birdhouses in the classroom or using tools in the Sculpture Studio. Astronomy major Willow Hasley used herbs from the studio to make homemade cough drops and teas for her EcoArt project. No weed killers or other chemicals are used in the Green Studio so the medicinal herbs and other edibles are safe to use. Cooley says they use permaculture practices to take care of the land and that it took years to build up the soil as it was basically rock and clay after the building construction.